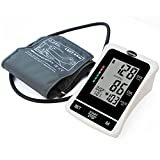 The Ben Belle fully automatic digital blood pressure monitor (main unit size : 115 x 155 x 70 mm) has a compact design and provides a quick and easy way to check for hypertension. The monitor has a large easy-to-read LCD (84.6 x 55.9 mm) display.The automatic memory function records the last 120 memories in 2 groups with date and time for efficient tracking. The Last 3 Results Average feature automatically calculates average readings stored in memory. The Ben Belle Monitor features an irregular heartbeat detection and has a hypertension level indicator for users who want to verify that their blood pressure is in the recommended level as proposed by the World health Organisation. An Irregular Heart Beat detector automatically alerts user when heart rhythm is either 25 percent faster or slower than the average rhythm detected during the measuring process. When using a Ben Belle blood pressure monitor, please ensure that the cuff size is correct. The Ben Belle monitor comes with a LARGE size cuff for arm circumference 30 cm to 42 cm. An optional medium size cuff suitable for arm circumference 22 cm to 36 cm is available to purchase separately. Please check if your upper arm circumference is between 30cm and 42cm before buy.This is digital blood pressure monitor with large cuff. tips: actal product is a little colour variation from the photoes because light, view,quantity of illumination and etc affect factors. Please understand. And please read the manual before use.